Are you or Christians you know asking, “Am I really a Christian?” Are Christ-followers in your church letting fear, past mistakes, doubts, and other troubles rob them of confidence in their final salvation? Then this article adapted from Robert A. Peterson’s The Assurance of Salvation: Biblical Hope for Our Struggles is for you. Below, you will discover a few reasons why God wants Christians to enjoy salvation now and be confident that we cannot lose it. The gospel itself is a substantial means that God uses graciously to assure his children that they belong to him. Let’s explore the assurance from one such passage, Ephesians 2:1-9. Here Paul digs a deep hole out of which God’s grace has dug all believers in Christ. First, before salvation we were spiritually dead, devoid of the life of God (v. 1). Second, we lived in the realm of sin and the world. Third, inadvertently, we followed the desires of Satan, who is active in unbelievers’ lives (v. 2). Fourth, we lived for our sinful desires (v. 3). Fifth, “like the rest, we were by nature deserving of wrath” (v. 3)—that is, we and the whole human race deserved to have God’s holy anger fall on us because of our rebellion against him. Why does the apostle paint such a bleak picture of the human condition before salvation? For two reasons. It is a true picture: we were lost and unable to rescue ourselves, and God wants us to keep those facts in mind. And it makes us grateful for grace. Diamonds never shine more brightly than against the jeweler’s purple cloth, so God’s matchless grace shines all the more brightly against the background of our terrible plight. Verses 4–5 contrast sharply with what precedes: “But because of his great love for us, God, who is rich in mercy, made us alive with Christ even when we were dead in transgressions.” Though we were as lost and helpless as the first three verses describe, God out of his abundant mercy loved us! Our salvation is certainly not because of any merit on our part. Rather, it is the result of God’s “love . . . mercy . . . grace . . . [and] kindness” (vv. 4–5, 7). How did God express his great compassion for us? He “made us alive with Christ” (v. 5). God caused those who were spiritually dead to come alive to himself. He did so “with Christ.” That is, he spiritually united us to his Son so that his resurrection became ours. As Christ was raised from the dead, so we were made alive to God in Christ. Paul regards God’s regenerating those dead in their sins as the epitome of grace. That’s why he says next: “It is by grace you have been saved” (v. 5). Grace is God in his kindness rescuing those who cannot rescue themselves. God not only joined us spiritually to Christ in his resurrection, he also “raised us up with Christ and seated us with him in the heavenly realms in Christ Jesus” (v. 6). Scripture only says this here (though Colossians 3:3 implies it). What is God’s purpose in this display of his marvelous grace in people’s lives? He does so, Paul replies, “in order that in the coming ages he might show the incomparable riches of his grace, expressed in his kindness to us in Christ Jesus” (v. 7). God puts his church on display to demonstrate his grace to human beings and angels. Again the apostle repeats a word of grace and expands it: “For it is by grace you have been saved, through faith—and this is not from yourselves, it is the gift of God—not by works, so that no one can boast.” (vv. 8–9). Salvation is all of God and all of grace. Surely we have no reason to boast in ourselves and every reason to boast in God and his lovingkindness. 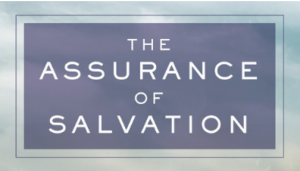 What does all this wonderful talk about God’s grace have to do with assurance? First, we note with Frank Thielman that in this passage salvation is a present blessing enjoyed by believers: “Here salvation is something that is emphatically present for believers. They have already been made alive with Christ, already raised with him, and even already seated with him in the heavenly places. Their resurrection has, in some sense, already taken place” (see Thielman’s book Ephesians). Paul usually points to the future when he deals with salvation; he presents it as a glorious hope. Here, however, he emphasizes the present. The final salvation of God’s people is so certain that in at least these two places—Ephesians 2:6 and Romans 8:30—he regards it as a fait accompli, a deed already done. God wants us to enjoy salvation now and to be confident that we cannot lose it. It is a permanent gift of his grace to his people. This good news should make us thankful, happy, and holy. Since the gospel includes God’s promise to forgive us, it brings assurance of salvation. The gospel proclaims that our heavenly Father loves and accepts us into his family when we trust his Son. “This book promises to bring godly confidence and quiet comfort to many troubled believers,” writes D. A. Carson. It will help its readers “diagnose their spiritual insecurity and restore their confidence in Christ. It is well suited for both personal and small group use,” writes Robert W. Yarbrough. “This honest and biblical book guides us away from saying to God, ‘But this time I really mean it,’ and toward hearing God say to us, ‘I will never leave you nor forsake you,” writes Ray Ortlund.